You have heard the phrase two minds are better than one; well what about when you put three hundred minds in the same swanky room? 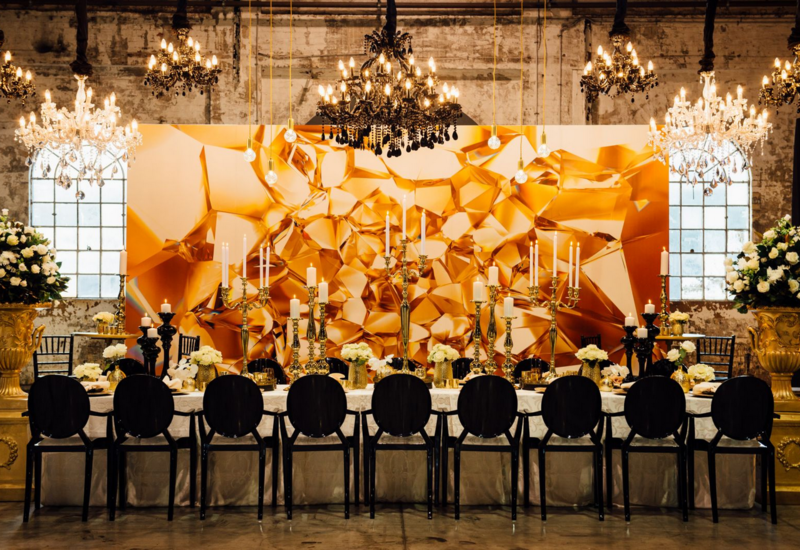 This fall sees the return of one of the most coveted events of the high-class calendar –Luxury interactive. Beneath the silver drizzle of the London Sky with its trendy and chic Oxford Street, its beautiful palatial like parks and its achingly chic and trendy restaurants, you will find Luxury Interactive in full swing comes to the pumpkin filled season of October. With over three hundred industry experts, top-level executives and marketing magicians, everyone is looking forward to a jam-packed agenda to listen, to speak, and to learn about the challenges, the solutions, the highs and the lows that those in the luxury niche have to face. With the event perfectly tailored towards today's growing trends in the trade this is an event that is sure to skyrocket industry knowledge and leave everyone with plenty of Michelin starred food for thought. Dealing in the art of bespoke digital solutions, the affluent agenda is set to cover such topics with thought-provoking talks on matters like; the fabulous future of luxury, next-generation communications, effective relationship strategies in the 21st century, building addictive apps and committing to the consumer through the art of social media. The two-day event goes on to cover the curves of plenty of ground leaving no stone unturned. This is a conference all about learning how to become personal online, building interactive mobile experiences, partnering with beautiful bloggers to curate a positive narrative, and how to correctly scale your business for foreign markets. 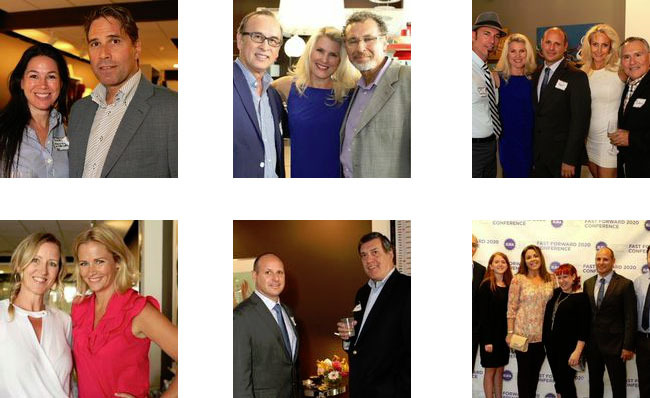 With savvy keynote speakers, roundtable discussions, solution lounges for innovative conversations, cocktail receptions and incredible lunches to boot, there is no doubt that Luxury Interactive is going to be an illuminating event. 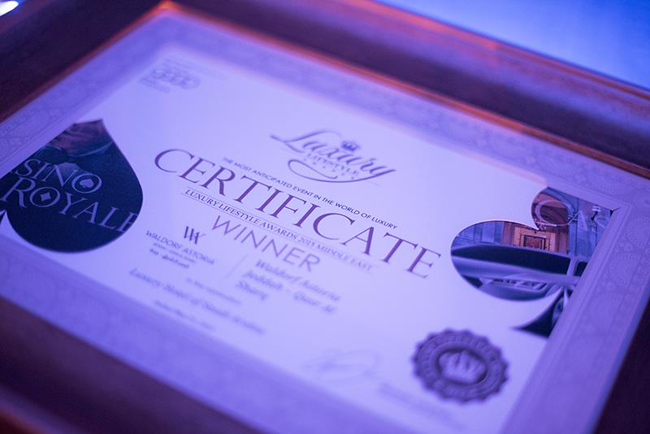 Luxury interactive staff are not only hosting and running the event but providing impeccable customer service and support throughout making it a networking dream for all involved. Everyone knows the luxury industry is rapidly gliding at a rate of knots like a gleaming superyacht towards the future. The world is changing and the luxury niche must change with it. Formerly, exclusive brands relied on beautiful stores with personal shoppers and tiny bright macaroons to set them apart from the crowd, but with online retail becoming such a large entity how do you move your brand forward to be an integral part of that world? Luxury Interactive reminds us we are all on the same roads of adaption and change and that more minds are better than one. Networking for many luxury brands will certainly be high on the agenda as this is a perfect chance to meet other influencers and make lasting connections that start with a spark and turn into blazing opportunities across the scope. To learn more about Luxury Interactive or to book your tickets, visit http://luxuryeu.wbresearch.com/. Luxexperience recognizes the breathtaking splendor of sweet travel and endless opportunity that the Southern Hemisphere offers and, inspired by these delights, has curated an exceptional three day event to connect those in the business of bespoke travel. Rolling into the cosmopolitan city of Sydney every September, you can find elite purveyors, representatives of the best luxury travel products, travel concierges, affluent agents, specialist wholesalers, and tailored private travel managers all amassing to stir up the luxury travel pot, make new connections and seek to nurture new relationships that are sure to last. The only event of its kind to kick up its heels in the heady world down under, stretching its fingers to bring together some of the most innovative names in luxury and experiential travel, Luxexperience is more than a simple booted and suited business exchange, it’s a soiree of networking opportunity, an inspiring possibility to learn, and a deep cut diamond experience that ensures every second of the three day event is filled with luxury. Invitation only attendees, a beautiful space in Sydney at the Australian Technology Park resonating with industrial grace and beauty, a well-executed program that blends fascinating presentations and business opportunities with elegant cocktail affairs, divine dinners, tours and networking parties – this is what the Luxexperience is sure to be about. It seems the Luxexperience truly tears a leaf from a shiny new book; every specially selected delegate attending the three-day event will receive their very own personalized pre-selected appointment schedule, their own social calendar and their own travel diary to ensure that their personal experience of the event runs like Swiss clockwork. Those traveling to take part in this whirlwind event will also have plenty of opportunities to see the chic and sophisticated city of Sydney with its iconic harbor, billowing white sails of the opera house, trendy boutiques, cool restaurant scene, and hip beaches filled to the helm with young surfers. This unique concept organized by the innovative team at Luxexperience provides the perfect win-win platform for everyone within the high-class travel industry. Exhibitors can be wooed by the idea of face to face meetings with clientele deeply rooted in the same niche market; seeking solutions and new partnerships that can ultimately boost business and bring a breath of fresh air. They will also get the chance to meet with those inspired bloggers and writers who represent some of the world’s best luxury travel publications and to connect on a whole new level with potential new partners. Buyers will be able to open up a treasure trove of possibility and to blend a bespoke first class travel experience with meeting others in the industry who can provide a dash of dreamy inspiration and insight into the exclusive trends the travel market is currently touching upon. 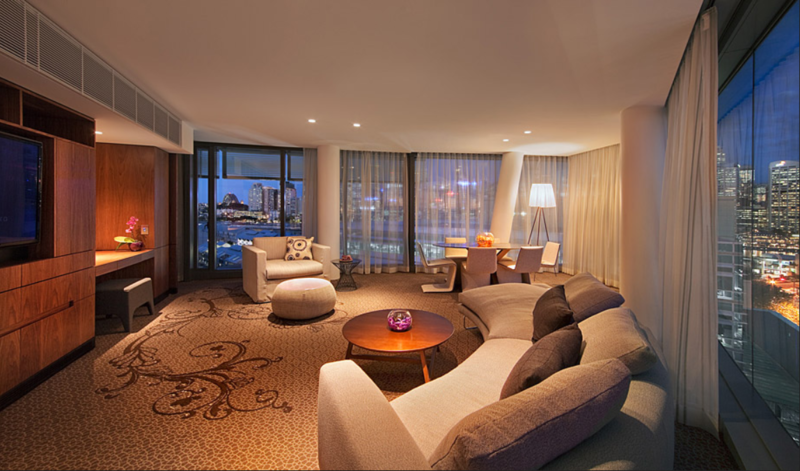 With an expected three hundred exhibitors rallying to be part of this incredible opportunity, you can be sure that the Luxexperience is one that will turn into a profitable stay in Sydney for all. The chance to touch down in one of the world’s most exciting capitals, to revel in real time face to face meetings with others in the industry, to attend gala dinners and cocktail events geared towards maximizing potential partnerships, and to dabble in some of Australasia’s and the South Pacific’s best indulgent travel experiences, this could turn out to be one of the most rewarding trips you ever make. 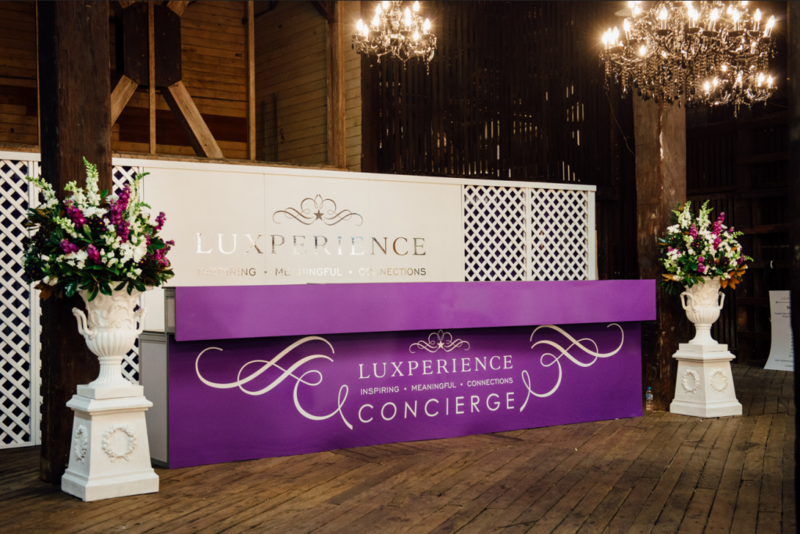 To find out the dates of the next Luxeperience, to become a sponsor, or to simply get to know the team better, visit https://www.luxperience.com.au/. 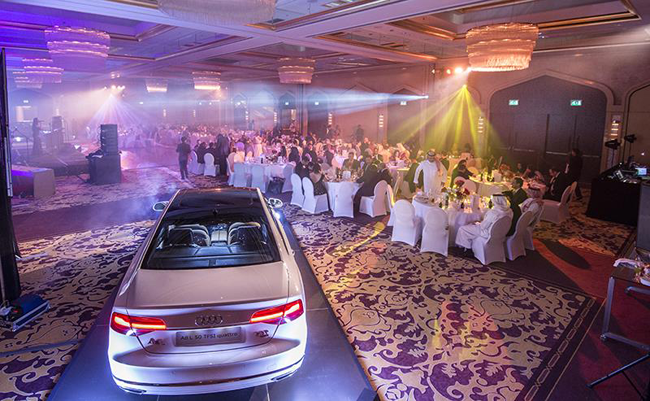 The most anticipated event in the world of luxury – the Gala Ceremony of the Luxury Lifestyle Awards 2015 Middle East – took place on the 21st of May at the fabulous Ritz-Carlton Hotel, Dubai. More than 250 guests, anxious to be the first to find out the names of the Winners, gathered for the Gala Dinner. 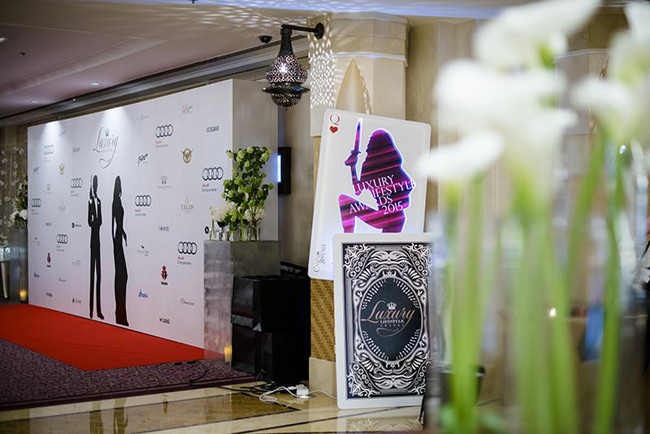 Luxury Lifestyle Awards 2015 Middle East was attended and evaluated by the honorary guests and juries including the members of Royal Families of Abu Dhabi, Dubai and Qatar, representatives of world-renowned luxury companies such as Bvlgari and LVMH, Xerjoff International, RFMAS Group, EMEA Trump Hotel Collection, The Kanoo Group, ESCADA, Vertu, L’oreal Luxe and others. All the Winners have been rewarded with the Golden Crowns by the Italian jewelry brand Faraone Mennella, as well as with the custom-made certificates in support of their undeniable excellence. 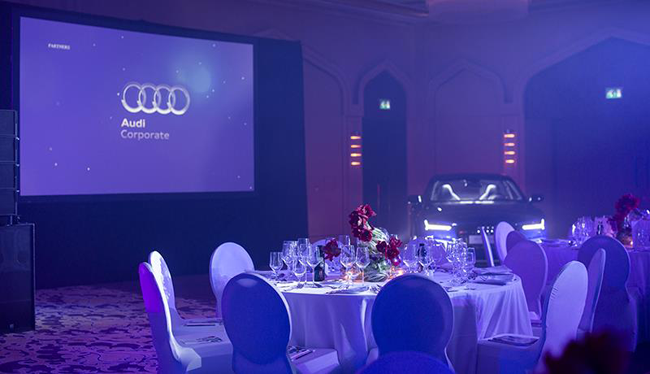 Luxury Lifestyle Awards expresses its deepest gratitude to its Title Partner Audi Corporate for its contribution to the event and providing the guests with an opportunity to appreciate the perfection and magnificence of Audi RS7 and A8 models. The time flew by with Talos Diamond Watches Partner that dazzled the guests with its high-end timepiece craftsmanship and exclusive diamond encrusted pieces. The Artisanal Partner Le Vault displayed the extraordinary handcrafted pieces and presented the custom-made gifts to the Luxury Interior Design Studio Winners while Atelier Habib, Interior Design Partner, displayed the artwork by Helmut Zwerger. 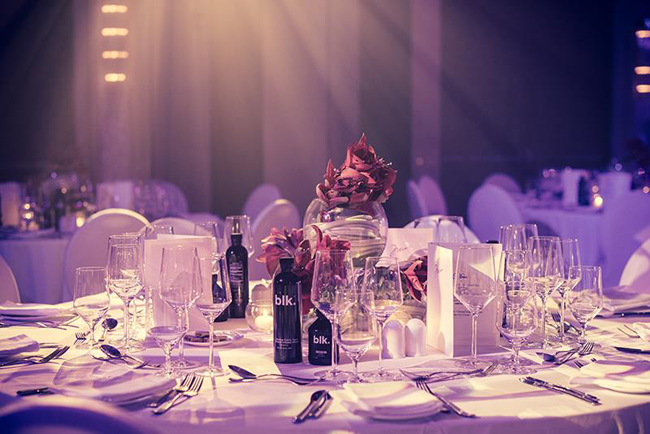 BLK, an Official Water Partner of the Luxury Lifestyle Awards granted the guests with the refreshing experience of tasting the first fulvic-enhanced mineral water. Crochet Flowers, Official Flower Partner, provided the beautiful flower arrangements and stunning winners’ bouquets for the Gala Ceremony. Luxury Lifestyle Awards also expresses its gratitude to the Falcon Aviation Services – Jet Partner, Pasha Life Insurance – Insurance Partner, and Luxury World Key – Concierge Partner for their supporting the Middle East Gala Ceremony. 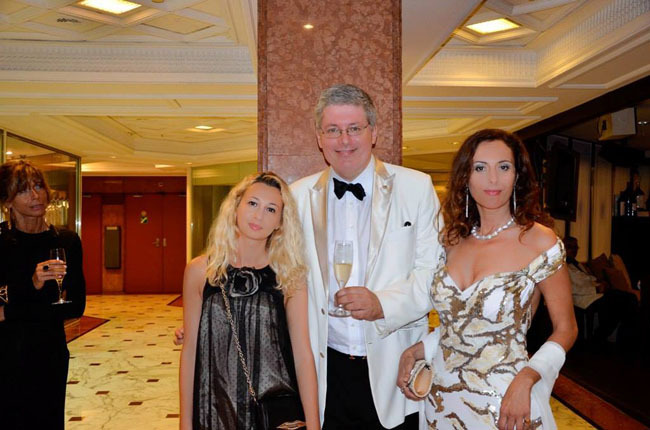 An unforgettable evening in Casino Royal style would have been impossible without the help and support of the event agency Plan A Events, creating the real “Bond” atmosphere. Luxury Lifestyle Awards wishes all the participants to maintain their high-level status and to delight clients by excellent quality and would be pleased to see them among the guests of the Luxury Lifestyle Awards 2015 Singapore. Meet Barak Hirschowitz, the President of International Luxury Hotel Association, and a leading influencer in the hospitality industry. Beginning his career as a chef, and becoming the best in this field, he went on to establish the International Luxury Hotel Association (ILHA). This global non-profit organization has one goal – to improve the standard of service in the luxury hotel industry. And it works to achieve this goal by providing resources for education, training and networking to its members. He is also the co-founder of Hospitality Recruitment that started in 2004. With a focus on international hospitality recruitment, it assists the world’s best hotels, resorts and cruise line companies source talent. Here is what he has to say about the luxury hospitality industry. 1. To be successful in an industry, one must be passionate. How and why did you choose to work within the luxury hotel industry? I was always attracted to the luxury hotel industry which allowed me to travel and work in the places where people vacation. My hospitality career started in the early 90’s as a chef in restaurants in New York. When I was offered the opportunity to join the team of a new luxury hotel in South Africa, I jumped at it. South African hotels have won best hotel in the world more times than any other country over the past 10 years. There is something special about the combination of great hospitality, design, food, wine and scenery that sets it apart. I was lucky to be able to spend 15 years in the industry there. 2. In 2003, you were voted as one of the Top 5 Chef in South Africa. In your opinion, what makes a Chef stand out from the rest? The ability to inspire their team, never compromise on ingredients and find their own style. 3. With other key players in the industry, you helped co-found the ILHA. Can you tell us a little about the mission and goals of the association? The ILHA brings together hotel and travel companies, industry professionals, governments and educators with the common goal of improving standards and promoting innovation in service and design in the luxury segment of the hotel industry. We achieve these goals through education, training and communication in three key areas that differentiate the luxury segment from the rest of the hotel industry: service, design and technology. 4. The ILHA is now considered the largest influencer in the hospitality industry with 185,000 members on LinkedIn. Can you give us a tip on how to grow such a strong community? The ILHA started in 2008 as Luxury Hoteliers, a small group of around 50 luxury hotel professionals who got together online to share best practices. At the time, people were still nervous about sharing ideas online with their competitors. It’s all about transparency and keeping pace with the changing needs of your guests. Early on our members figured out it was better to work together. It’s what helped us grow and keeps us growing. Today, our LI group has over 1000 new members joining each week. 5. For someone new to LinkedIn, what is the best way to get involved within the ILHA community? Join the discussions. It will help you stay on top of the industry’s hot topics. 6. The ILHA will be hosting the Fast Forward 2020 Conference in Washington DC this September. Tell us about it. We have invited the luxury hotel industry’s thought leaders to DC to answer some of the greatest challenges facing hoteliers today and over the next five years. 7. 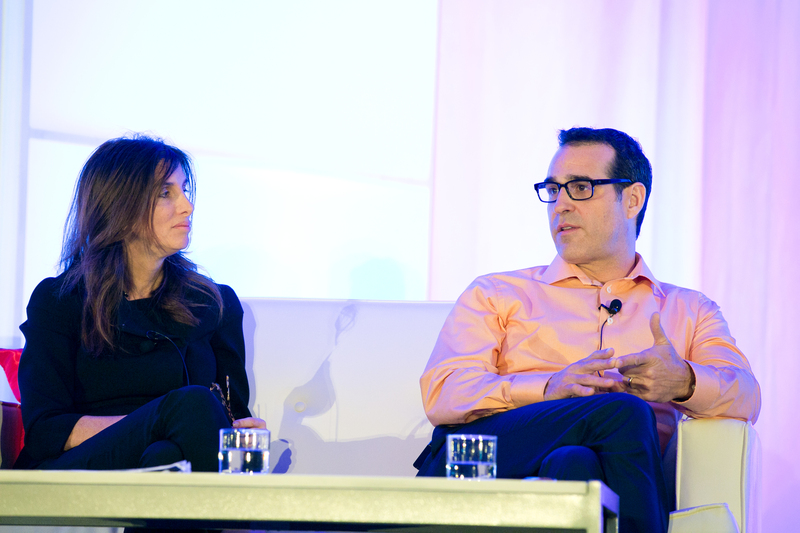 An impressive group of speakers will be giving advice at Fast Forward 2020, what should attendees expect to learn? This is a must-attend event for anyone working with or in the luxury hotel industry. We worked with leaders from the world’s top hotel groups to find out what are the greatest challenges they are facing right now. What type of online and social media marketing is working? What new in-house technology is out there? How are the leading hotels managing their online reputation? How to attract and prepare for business from new travel markets like China, Brazil and the multi-billion dollar wellness/medical travel? Can hotels benefit from partnering with luxury retail brands? The ILHA Fast Forward 2020 will bring together the smartest minds in the business to share their insights on how best to face these challenges now and over the next five years. Our experts are the leadership of hotel groups, universities, and major travel companies. They represent some of the biggest names in the industry including Ritz-Carlton, Hyatt, Trump, Michelin, STR, TripAdvisor, LuxuryLink, Cornell University, Georgetown University, Axess Worldwide and more. 8. Apart from listening to industry leaders, what else can attendees expect at the conference? In addition to networking opportunities, the ILHA attendees will have access to the Medical Tourism Association’s Congress being held in partnership with our event. This expo will have over 3,000 attendees and will introduce hoteliers to the fastest growing segment of the hospitality industry. 9. What does the future hold for the ILHA? We are currently developing service training that can be taken regardless of location. 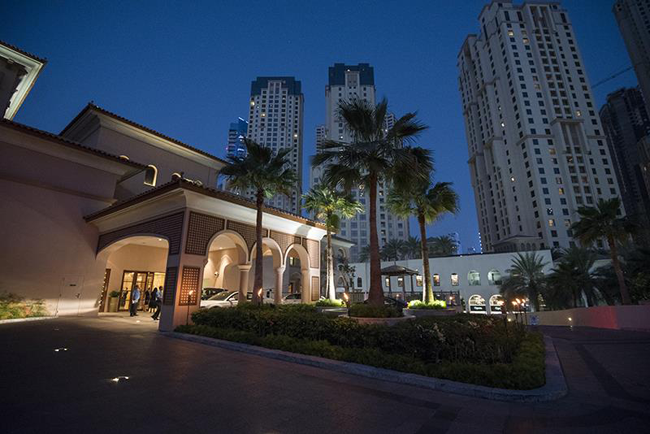 It will help hotels located in remote locations train their staff and can help level the playing field for hospitality professionals wanting to move into the luxury segment. Another focus for us is to introduce chapters and local networking events outside the US. 10. As a last question, what is your personal definition of "luxury service"? 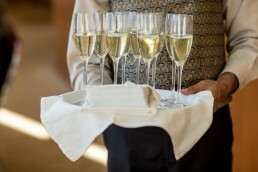 True luxury service needs to be personalized. It’s what sets the best hotels in the world apart from the rest. When the guest leaves the hotel at the end of their stay, they should feel rested yet a little sad as if they are leaving their family behind. Want to connect with Barak Hirschowitz? Do it on LinkedIn and Twitter. Or, reach out to us for an introduction. 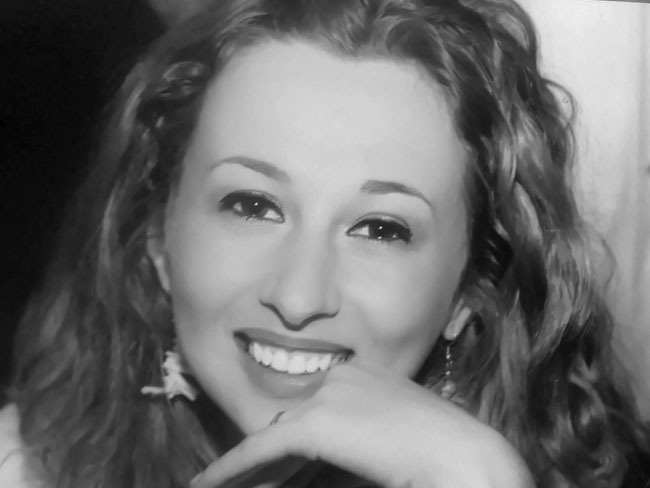 With years of experience in the field of journalism and editing, Andra Oprea offers an insight into the world of luxury with her digital magazine – Stylezza. As the Editor-in-Chief & Project Manager of this famed magazine, she has come across the best in class experiences when it comes to fashion, beauty, art, photography and myriad other subjects. Her experiences have led her to believe in quality over quantity – something reflected in the selection of which events and news feature in her magazine. And with her flair for the artistic expressions of life, it isn’t a surprise that Stylezza has become one of the beacons in the French Riviera/Monaco fashion and art circuit. Let’s get a glimpse at what she has to say about her contributions to the luxury niche. 1. Every editor has a different story on how they got started writing. What is yours? My story with writing starts when I was little or maybe from another life. I have always been connected with written words, poetry. I remember I used to invent and compose poetry in my mind holding a hand upside down when I was about four years old. With time, the passion has grown. When I first discovered love, I got so inspired that I started writing my first essay at 17 years old. The essay was awarded at an international competition in Tokyo. I continued writing children books, essays, never got the time to start a book although the idea has always haunted me. But, I started Journalism and it got me going ever since. I can use writing in a modern way now, especially on the digital format. It is my way of expressing, of choosing what to do in order to leave something behind me that is made by me and not an echo. 2. Like most successful fashion magazine, you probably received hundreds of emails per month from luxury brands who want you to share their story. What makes you decide to work with a brand over the other? I daily receive a great amount of emails from different brands around the globe. What makes me choose one brand over the other is the inspiration and the idea behind the concept. I do not like very much the commercial type, the mass quantity information. I prefer the quality and the information that inspires the reader and makes him widen his vision. I like the mix between art and fashion, the stir of ideas and the things that have value, originality. There are so many brilliant minds and brands that are in the dark because they do not have the marketing behind them, and so many futile brands that have the money but not the worth. So, I prefer choosing the value. Not everything that has created a name during the years because it was supported financially has to be chosen just to make clicks. No, I prefer to make value. And that is why I appreciate my readers! 3. What is the best pitch you have received from a luxury brand? What is the worst? There are so many that I can`t classify them. I don`t have a best pitch in mind, but the worst are those who are poor in information and quality and try to hook you no matter what. 4. What is your take on press releases? Do you like receiving them or do you simply discard them? I like receiving press releases; it is a great source of information. Still, it depends on the message it wants to convey or the way it is done. I like to see good content that has all the ingredients for a good article. What makes me click and read the press release is a good title or idea worth spreading. 5. What would make you choose to work with a brand on a giveaway campaign on your site? A giveaway campaign is always a challenge for my readers and the main focus is on them. We organize this type of campaigns when the prize fits our target and the magazine`s profile. It has to be interactive, to involve the readers and most of the time they do get involved by commenting on the article, on the social networks. 6. If a brand wants to reach you, what channel should they use? Do you prefer email, social media or another means of communication? I prefer having the information by email. It is more complex, it can have more accurate and precise information, all we need just in front of our eyes. Of course, if we want to develop even more the partnership, we can meet or discuss over the phone. The email, I think, it is now the most important form of reaching and connecting, spreading the ideas, creating partnerships and collaborations. 7. Of all the social media channels you engage on, which one do you prefer and why? Every social network has its own particularities. But, for spreading the news over social media, I prefer Facebook: it has an easier way of connecting and reaching, sharing the info in a complex way (text, photo), it can be interactive and you can control the views and reactions. Then, I prefer Instagram for another side of the story – the message through an image, simple as that! 8. Which social media channels does your audience interact with the most? Our readers interact differently on our social channels. It depends very much of the geolocalisation. If they are from US, they interact a lot on Twitter, while the Europeans like Facebook more. Also, it depends a lot on the time of posting, on the same criteria as above. 9. In your opinion, what does it take to become successful on social media? On social media, just like on every other digital platform, you have to inspire but also you have to reach your target. Many prefer posting frequently once every hour, others prefer less quantity. It depends very much to whom you address to, which social category, status etc. It is known that young people will tend to be more active on social networks and want as much information as possible, while other categories like top managers will be interested in quality information over quantity, to have the best news of interest to them even if they enter late at night, so to say. So, for me, is having the right information delivered to the right category of readers at the right time. 10. Do you monitor your Klout score on a daily/weekly basis? Do you think this social ranking is of any real value to luxury brands? I do not use Klout very often. I think, though, that being on platforms that help you reach your readers can be a great step towards a wider audience. 11. Do you sometime receive compensation from luxury brands, whether it's in the form of cash or incentives, to write about them? Yes, it happens often to receive products in order to write about them. Sometimes, it is a great thing because you can test the product yourself and write about it. Of course, you have to maintain your neutrality. This is one of the factors that differentiate blogs from digital magazines. Blogs can express their opinions towards products, brands in a personal way while digital magazines publish the news following deontological codes, and objectivity is one of them. 12. Apart from promoting brands through your magazine, do you offer additional services to luxury brands who choose to work with you? Stylezza is a digital magazine that focuses also on branding on the French Riviera / Monaco and on high class events. We have contacts with important people in the area who are always interested in partnering with us to create events (and here, we have some secret ingredients that can assure the uniqueness and originality of the event). Also, there are international brands that are interested in having visibility on the French Riviera / Monaco and here we can help them. 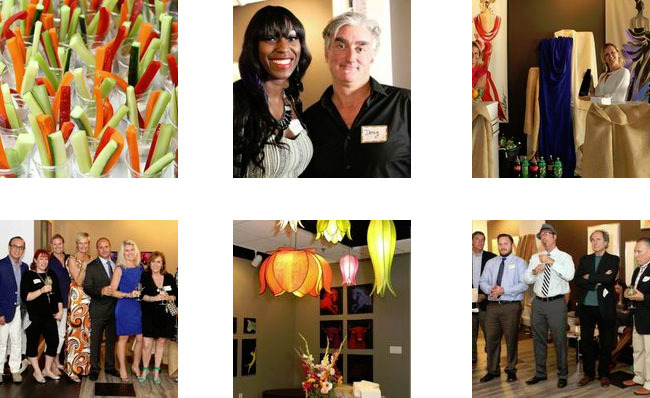 There is a mix of editorial, photography, events, all focused on the partners that we collaborate with. 13. Do you manage more than one magazine/blog? If so, which ones? I manage Stylezza magazine. It is a digital platform located in a very beautiful area of the French Riviera. We cover the most important news and events in the region, especially Monaco, Cannes, St Tropez. It is both in English and in French as it reaches an international audience with worldwide news. 14. What would you say is the best thing about being a fashion editor? The best thing about being a fashion editor is that I write, and this is my passion. Second, is that I get to know amazing people and places, exchanging ideas and traveling. 15. Have you rub shoulders with the rich and famous through your work as a fashion editor? Yes, I have shaken hands and discussed with very important names, with top managers, celebrity and royalty. A real honor to meet so many important people, to share ideas, to interview or to collaborate. 16. If you had to mentor a new writer, what is your go-to advice to become successful? My best advice that I can give to a new writer it is to write with passion, to give his time to develop this passion. To read and write a lot! I remember one of my Journalism University Professor who used to tell us at his class that we should write everyday about every tiny thing that we see around us...but just write! You can reach Andra Oprea with the contact form on the site, or get in touch on Facebook, Twitter, YouTube or Google+. If you need an introduction, just reach out to us. A new year brings a new set of luxury events to attend in the hopes of discovering the best in every class. Whether you love supercars, private jets or high fashion, the following events will cater to your need for new luxury. Why not discover a one-of-a-kind couture dress or an exotic perfume to go along with your new Porsche Cayman S? Or how about spending time with the best naval architect to design your very own superyacht? The luxury events cater to each of your fantasies! Here is our curated list of nine must-attend luxury events of 2014; events that will capture the hearts of luxury connoisseurs. Showcasing new looks from famed fashion houses such as Armani, Versace or Dolce & Gabbana or from up-and-coming designers such as Uma Wang, Fausto Puglisi or Iceberg, the Milan Fashion Week should be on everyone's calendar of must-attend events. Considered one of the "Big Four" in high fashion, the Milan Fashion Week is a dynamic display of creative diversity. From the latest innovations of Girard-PerreGaux to the timeless designs of Breguet; from the classicism of Faberge to the modernism of Cartier, Baselworld brings together the best luxury watch and fine jewelry industry leaders. Set in a sophisticated space, the exhibition invites watch aficionados to either admire or purchase the high-end items on display. The 1.618 Sustainable Luxury Fair is a prestigious affair that aims to demonstrate the relationship between beauty, creativity, authenticity and sustainability in redefining luxury. The event showcases a series of trends, innovations, inspirations and initiatives that contributes in making the world a greener piece of luxury. This award-winning event showcases the big luxury players. Meet Porsche, Ferrari, Maserati in the automobile area; Franck Muller, Patek Philippe, Audemars Piguet in the haute horlogerie quarter; and Davidoff, Taschen and Crystal caviar in the luxury section. Need more reasons to visit Top Marques? How about an evening of elegance at one of Monaco's myriad luxury hotels? Amazing antiques, fabulous folk art, gorgeous sculptures, exclusive jewelry and exquisite miniatures – the Masterpiece Fair is a treasure trove for art enthusiasts. Each exhibit at this world-class event is worthy of your visit. This is most likely why so many renowned artists, collectors, exhibitors and curators participate in this event. With an impressive display of superyachts, by exhibitors such as FEADSHIP, LÜRSSEN, and Heesen Yachts, the Monaco Yacht Show is one event that is a must if you consider yourself to be a superyacht connoisseur. Organized under the patronage of HSH Prince Albert II of Monaco, this show offers the opportunity to catch the latest in superyachting. Nicknamed the ‘Yachting Capital of the World’, Fort Lauderdale hosts one of the best superyacht shows in the world. Regardless of your preference, you will most likely find the pleasure craft of your dreams at the Fort Lauderdale International Boat Show. If not, you will surely reconnect with old friends and make new ones since the event is attended by innumerable jetsetters. Art Basel brings together artists and art lovers to celebrate their passion for visual media. From the paintings and drawings of Modern Masters to the sculptures and architectural pieces of contemporary creators to the photographs of emerging talents, Art Basel provides an ideal setting to promote art. An opportunity to view upcoming styles and trends, the New York Fashion Week should be on the must-visit list of everyone in the fashion circuit. Sport your best evening attire to attend runway shows of the most talked about designers; dine with supermodels and celebrities; or find that perfect couture clothing item for that special event. If you love fashion, you will love the New York Fashion Week. Attend any one of these luxury events in style by either staying at a five-star hotel or chartering a superyacht. Set to offer a glimpse into the lives of the uber elite, the 2014 superyacht show lineup is sure to be exciting. Whether you want to design your own Feadship or whether you prefer to book a private charter yacht aboard MY Starfire, don't miss out on the action of the much anticipated superyacht and lifestyle events happening this year. 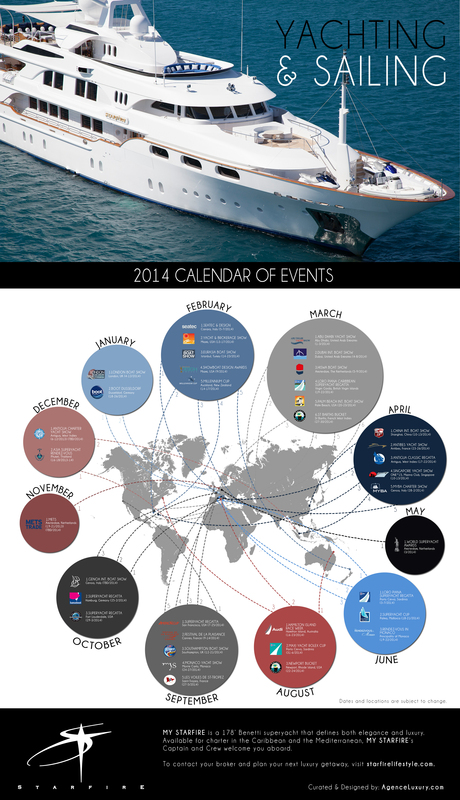 Here is a quick roundup of our Top 10 Superyacht Shows to Attend in 2014. Europe’s first boat show - it’s 60 year old - is sure to allure those who love our ocean and its myriad watersports activities. Admire the craftsmanship of hundreds of boats; talk to superyacht owners and experts; check out auxiliary products and services; learn about new techniques and technology; and enjoy every minute of this coveted event. Showcasing more than 450 luxury yachts, the Superyacht Pavilion is a huge draw for both VIP and the media. Partake in the launch of new superyachts; explore state-of-the-art dive equipment; admire exclusive automobiles at the Supercar Promenade; and rub shoulders with the elite at the Dubai International Boat Show. Conceptualized by Delphine Lignieres, the Hainan Rendez-Vous offers a peek into the trends of luxury lifestyle in Asia. With a superyacht pavilion, a private jet pavilion and a luxury property pavilion, each adorned with some of the best in class assets, this luxury event showcases the ever increasing opulence among China's elite. Creating the ultimate luxury yachting experience, the Singapore Yacht Show is the ultimate display of extravagance. The show boasts some of the finest parties and chic product launches alongside myriad superyachts, lavish waterfront properties available for purchase and fine dining establishments. Launched 19 years ago in the hopes of stirring Chinese interest in yachting, the China (Shanghai) International Boat Show is growing in popularity every year. Along with the impressive range of luxury yachts on display, this boat show hosts several watersports, leisure activities and lifestyle goods. Set to gather superyachts at the beginning of the Mediterranean yacht charter season, the Antibes Yacht Show is the ideal event to visit if you are looking to either sell, buy or charter a luxury yacht. It is also the preferred venue for superyacht crew looking for new employment. Dedicated to superyachts in all its glory, the MYBA Yacht Charter Show is getting ready to offer a singular experience to attendees with a dynamic social program and a Gala Event. The show also offers an ideal opportunity for charter professionals to connect and network with some of the most renowned charter agencies and brokers from across the globe. This year the Beirut Boat Show is changing location to accommodate its growing popularity. On display will be several luxury yachts, products and services that defines the lifestyle of those who prefer the finer things in life. Enjoy the Beirut Boat Show's chic and relaxed atmosphere. Known worldwide as Europe’s first in-water boat show, the Cannes International Yacht Show showcases some of the finest vessels against the splendid French Riviera backdrop. Leisurely make your way along the hundreds of sailboats, speedboats and luxury yachts made available for your enjoyment. Patronized by HSH Prince Albert II of Monaco, the Monaco Yacht Show brings forward the best in class superyachts from around the world. A prestigious event for jetsetters, this superyacht event is the perfect platform to learn about nautical and technological innovations and new luxury yachting services. With a host of superyacht events trying to capture your attention, 2014 is sure to enchant the superyacht aficionado in everyone.